We have some great news for all teachers using Voki Classroom, and (especially) their students! As you know, we love receiving feedback and ideas from Voki users! Your feedback helps us learn what we are doing right, and how we can make Voki even more useful. A great suggestion we have received from many teachers using Voki Classroom is to simplify the student login names. Teachers mentioned that the current student logins are rather long, and that students have a hard time remembering them. As you mentioned, students would have an easier time remembering a shorter, simplier login. So, we have worked hard to implement a solution to this. We are simplifying student logins! Below are examples of the current student login formats. The default student logins are comprised of: First name . Middle name . Last name : Teacher email – this can lead to very long student logins. Also, many teachers don’t want their email address to be part of their students’ logins. Therefore, we implemented a minor solution called the Teacher ID. Basically, we allowed teachers to choose a unique ID that would replace their email in student logins. Student logins under teachers who had defined a Teacher ID were comprised of: First name . Middle name . Last name : Teacher ID – this led to shorter student logins, but it was not optimal. Everyone affected will receive an email notification, as well as another reminder the day before the change. Technically, there’s nothing you need to do, since the change will happen automatically. However, you should provide your students with their new logins once the change occurs. Tip: If you are unable to tell your students about the change, we’ll do it for you. When students log in using their old logins, they will see an alert. This alert will provide their new login and ask them to use it from now on. Note: Student passwords are not affected, unless you decide to change them. 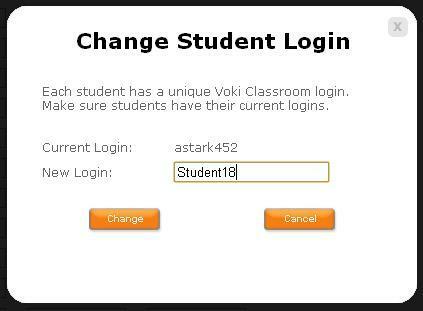 We hope that the new student logins makes logging in to Voki Classroom a much simpler process for your students! Thanks for the great feedback – keep it coming! i have created a voki but do i have a student login? My students and I like to make our Voki wall public, so we intentionally avoid the use of last names in order to protect student privacy on the web. My roster, therefore, consists of first names and last initials only (with a distinguishing middle initial if needed). Since the automatic username change will be based on LAST names but my entire roster is based on FIRST names, I will now need to go in and revise all 150+ usernames again by hand. Hope I’ll be able to figure out who’s who! We also try not to use last names for privacy when making our vokis public. We may start using screen names instead. My name is Ellen Rosenzweig and I have a class account with you — McKenna Elementary School in Massapequa Park, NY. I’m trying to “Review” my students’ text on their VOKI and I’m having trouble locating it. I am able to see their anime and hear the text but I would like to see the text so that I correct any errors. is there a way to do it? At this time, teachers cannot review the students’ text on their Voki. We are making some important changes soon that will benefit you so please stay tuned! If you have any further questions, please use your unlimited support on Voki Classroom by clicking the support tab. This will direct you to the Voki Classroom Support Team for immediate attention. Nothing wrong with the old login, now I have to give everyone a new, non-intuitive login and they’ll have to remember the three digits, the old login was just fine. Let’s get some meaningful updates, like three types of status: work-in-progress, submitted, approved. I’m tired, and the students are frustrated, when I reject an unfinished work. Thank you for your feedback. We do appreciate that existing Voki Classroom users will have to take the time to reissue the logins to their students. The upside to this new feature is that you may edit the login name as you see fit to make it more intuitive or meet privacy requirements. The login names are also much shorter and easier to remember than the previous logins. Currently, we are working on updating the status types and welcome your feedback once the features is ready. To create an account with Voki, please go to http://www.voki.com. Then click “Get Voki” on the side and a new pop up will appear. Enter all your information and your email address. You must be 13 years or older to create an account. You will receive a notification email to activate your account. After your account is activated, you can log in and start creating your first Voki! Just wondering how students log on to access their accounts without an email address I couldnt find a students log in link anywhere. When I tried using the usual log in it tells me the email address is invalid. This is disappointing as my students really enjoyed their first encounter with Voki and now we cannot log on to continue working with our Voki. I have sent 2 emails to the 24/7 support over 2 months ago and I have had no reply – this is also disheartening as there is 2 months of subscription down the drain. Is anyone able to help me PLEASE!!!! Make sure that your students sign in here: https://voki.com/classroom/login_status.php? and not on the Voki homepage! If you sign in on the Voki homepage, it’s not going to work!